Let’s go over some things, shall we? Where do they get these sweaters? Uh…. oookay. But how did you ask for that? Hm.. see what I mean? Asking someone to borrow something ugly/gross/tacky from them is awkward. It’d be like going to your skanky girlfriend and asking her for makeup tips so you can truly look the part as an authentic ‘ho for Halloween. So spare your promiscuous girlfriend and adorably-tacky-sweater-wearing grandma’s feelings and just… don’t ask them these things. It’s weird. Also weird? Stuffed animals in the back dashboard of cars. I mean, why? What is the purpose? With the holidays coming up quickly now (can you believe Thanksgiving is tomorrow?!) I need to start practicing some cookie recipes for the annual cookie-baskets I usually make for coworkers, professors, the SPCA, and local firemen. Um… these are definitely going in them. They’re based after one of my favorite cookies I pick up every Saturday at a local sandwich shop me and Jessie visit. 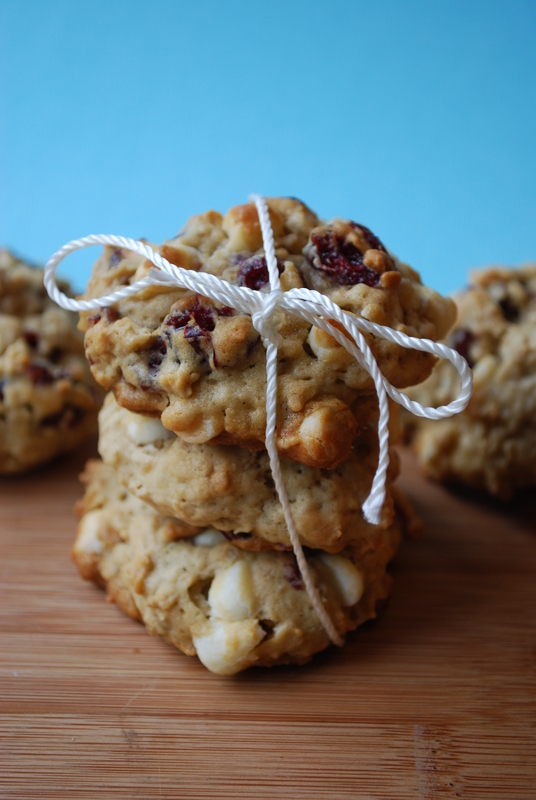 They’re oatmeal cookies loaded with cranberries and white chocolate. Hello, deliciousness. 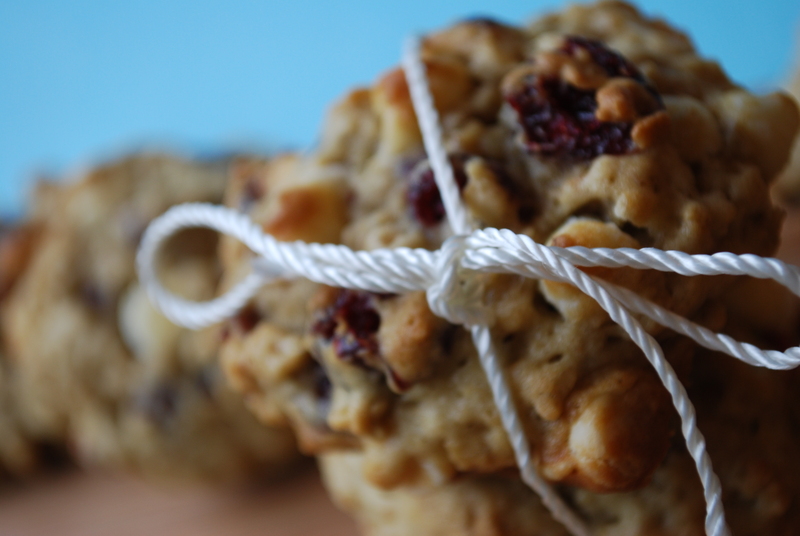 The cranberry’s add a nice tart pinch of flavor and the white chocolate… well, need I explain more? Make them. Love them. Right now. 1. Preheat oven to 375 degrees F. Lightly grease two baking sheets with cooking spray; pat excess spray off with a paper towel. Set aside. 2. In a large bowl, beat together butter and sugar until creamy. Add in eggs and vanilla extract until blended. In another bowl, whisk together the flour, oats, baking soda and salt until combined. Gradually add flour mixture into the butter mixture, about 1 cup at a time, until a soft dough forms. 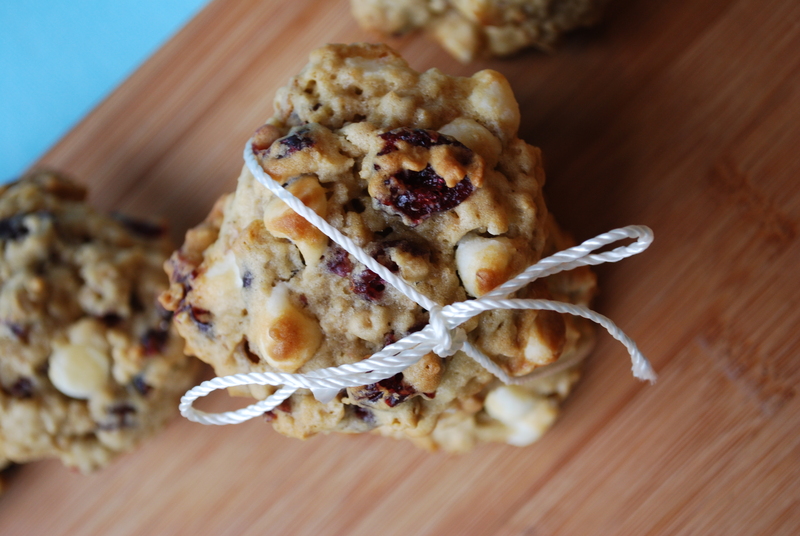 Stir in cranberries and white chocolate chips. 3. Drop teaspoonfuls of dough onto the greased cookie sheets, about 1-2″ apart. Bake approx. 10-12 minutes, rotating baking sheets halfway through baking time, until golden brown and set. Cool on sheets about 5 mins, then transfer to wire racks to cool completely. Store airtight. I love how easy these are to wrap up and gift to some of your favorite people. Or to the poor grandmas and mothers of the world who have ugly sweaters… doesn’t matter. Have a WONDERFUL Thanksgiving tomorrow! Eat tons and have fun! And just so you know, I’m all especially thankful for YOU in supporting me through and through. You rock! I’m always afraid of wearing an “ugly sweater” only to find out someone has the sweater and doesnt know its ugly! Lol! Thankfully this has never happened to me, but I can imagine it would be super duper embarrassing… and then hilarious. Hope you had a good Thanksgiving! Yummy cookies. I started using oatmeal in my recipes as well and I find it quite interesting. Thanks for the recipe. I will bookmark it for a future reference. Hi there! Thanks for stopping by! 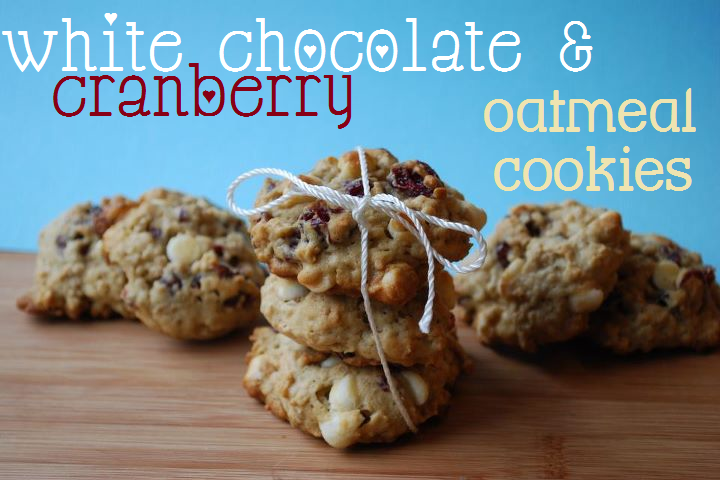 I love using the oatmeal in these cookies because it gives it a wonderful texture. Let me know what you think when you make them! xo.